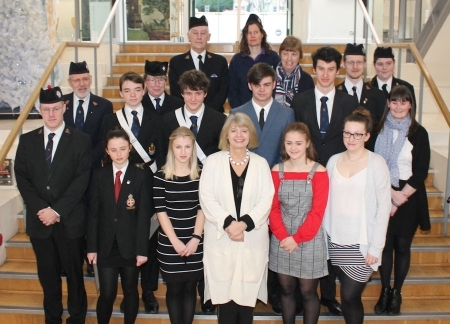 West Worcestershire MP Harriett Baldwin celebrated the arrival of the new year presenting a handful of local young people with their Duke of Edinburgh awards. The MP was invited to present five gold and four bronze awards to award recipients, who are all members of the Malvern’s Boy’s and Girl’s Brigade Companies, at a ceremony held in the Malvern Theatre last week (Saturday January 5). Harriett commented: “This is the third time that I have been asked to present the Duke of Edinburgh awards to the Malvern Boys’ and Girls’ Brigade and its always an inspirational start to the year for me. “It is an amazing achievement for so many people to earn their awards and pleasing to see them taking up jobs and study locally. Photo: Harriett Baldwin MP (bottom row, centre) with award recipients and officers of the Malvern’s Boy’s and Girl’s Brigade Companies.